Freefrom Vegetable & Cheese Pie. 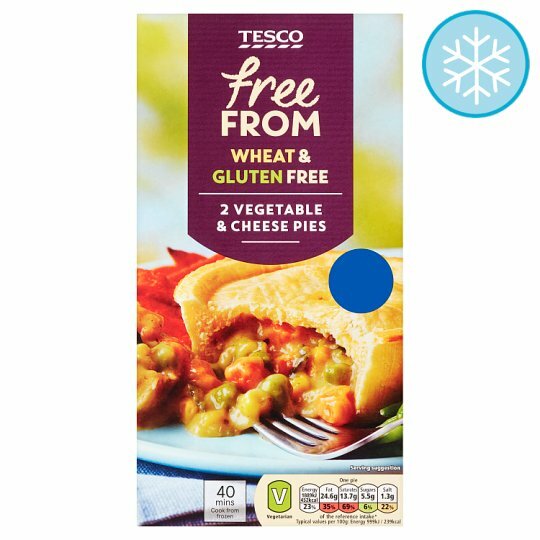 Gluten free shortcrust pastry filled with mixed vegetables in a Cheddar cheese sauce topped with gluten free shortcrust pastry. INGREDIENTS: Water, Vegetables (24%) (Leek, Courgette, Butternut Squash, Sweet Potato, Sweetcorn, Peas), Potato Starch, Cornflour, Palm Oil, Egg, Mature Cheddar Cheese (Milk) (4.5%), Butter (Milk), Corn Starch, Cream (Milk), Rice Flour, Salt, Dried Whole Milk, Thickener (Guar Gum), Sugar, Flavouring, Onion Powder, Rapeseed Oil, Yeast Extract, Thyme, Garlic Purée, Emulsifier (Mono- and Di-Glycerides of Fatty Acids), Black Pepper, Stabiliser (Methyl Cellulose). Instructions: Place on a baking tray in the centre of a pre-heated oven for 30 -40 minutes. Instructions: For best results cook from frozen. Place on a baking tray in the centre of a pre-heated oven for 30-40 minutes. Remove outer packaging but leave pies in their foils.